I have mentioned before that the most important factor to the economic potential of Iskandar and Johor Bahru is the extension of Singapore’s MRT to Johor Bahru. I mentioned being skeptical of the claimed timeline years ago. And, in fact, that timeline has proven to be wrong. Hopping onto an MRT train and arriving in Johor Baru is unlikely to be a reality before 2020, as Malaysia has yet to determine a station site for its end of the line. This Rapid Transit System link was first announced by Singapore and Malaysia in May 2010, and was initially targeted to be ready by 2018. Rail construction experts said even if work started today, the line would be completed by 2020 at the earliest. But work is unlikely to start any time soon because no decision has yet been made on where the JB station will be. And this article is only addressing 1 Johor Bahru MRT station. While that would still be useful. The discussion 4 years ago was starting with 5 stations in Johor Bahru which seems like a much more sensible starting point. Getting to 5 stations by the end of 2021 seems unlikely unless those responsible change the approach and treat this as a critically important project. The importance of an MRT transportation system interlinking Singapore and Johor Bahru has only grown more critical in the last few years. Transportation issues are going to become increasingly annoying in Johor Bahru as all the luxury condos come online. And getting people into those condos that can afford them is still unrealistic without jobs in Singapore, for which the MRT extension is critical. Sadly one of the features of living in Johor Bahru is having to accept unreliable service. My 9:30 AM taxi isn’t here (after 9:50 AM). The only phone numbers online for the JB-Singapore taxis that I can find are never answered. I don’t mean like they take a long time or sometimes are not answered. I mean I have never had a call answered. Now he called and just said he isn’t going to do it I have to find some solution myself half an hour after they were suppose to be here. FoodPanda, which is a good idea, just doesn’t deliver what you order sometimes. It is like a lottery. Maybe they will deliver maybe they won’t. Earlier this week they just didn’t. Also earlier this week a called a local cab which just never showed up. I have tried various companies and this one is the least bad. But still will just sometimes not show up at all. That is it, you are just left stranded. Bad service is everywhere around the globe. But in the USA you can usually avoid it other than in politically protected monopolistic companies (Comcast, Verizon etc.) and airlines. For example, you can get around normal car dealers. If you care about decent service you just don’t deal with companies that provide lousy service. But in JB I find it very hard to do. You just are stuck with very limited options and finding those that offer reliable service is just either not possible or beyond my capabilities quite often. If anyone knows a reliable “yellow cab” from JB to Singapore please let me know. There are many good things about living in JB. But the poor reliability of companies is tiresome. 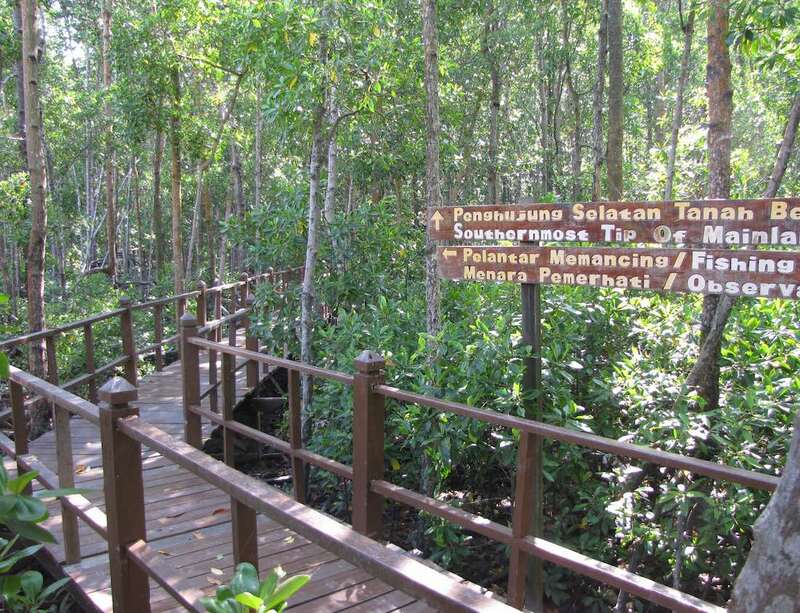 One of the many advantages of living in Malaysia is the number of great tourist destinations that are fairly easy to travel to. The plane trips are so much better than the horrible system now in place in the USA (much better service, no TSA security theater, many fewer delays…). Prices are reasonable also. I will gladly pay $50 US to fly on the airlines like Malaysia Airlines (which I flew this time) and Singapore Airlines over some of the budget airlines. I just don’t want to deal with companies that are going to try to rip you off any chance they get and have much less reliable flights (cancelling them more often, etc.). I will fly Firefly. The flights from Johor Bahru are not very good, pretty much you have to go through Kuala Lumpor, which is fine, but you can be stuck with long waits which I don’t like. Still often it is preferable to flying out of Singapore (though not always). On this trip, to avoid that long delay I was able to fly JB to KL to Siem Reap and then on the way back fly Phnom Penh to KL to JB. These both had short layovers but Siem Reap to KL to JB had over 4 hours wait. I took the bus from Siem Reap to Phnom Penh. 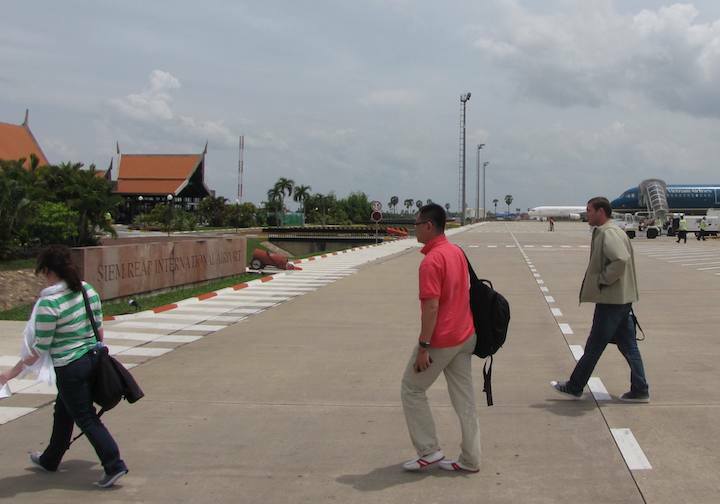 The Siem Reap airport is nice, new and small. You need a passport photo for your visa (which I just happen to carry with me from my memories as a child of needed them, but I hadn’t read anything about needing them). Those with passports from many countries you can get a visa at the airport (you don’t need one in advance) but you should make sure this is true for your country in advance. The cost was $20 US. I would imagine that you can get the photo there (for a high price, I would guess) but even more annoying is probably the delay it would add of waiting in another line). The land transport authorites of Singapore and Malaysia are studying a rapid transit system (RTS) link between Singapore and Johor Baru. The architecture and engineering consultancy consists of two phases. Phase one is expected to be completed by year-end.The Joint Ministerial Committee for Iskandar will decide on the option to be adopted in phase two. Taxi services between Johor Baru and Singapore are also being improved. Effective June 1, commuters taking cross-border taxis will be able to board and alight anywhere on the domestic leg of the journey. 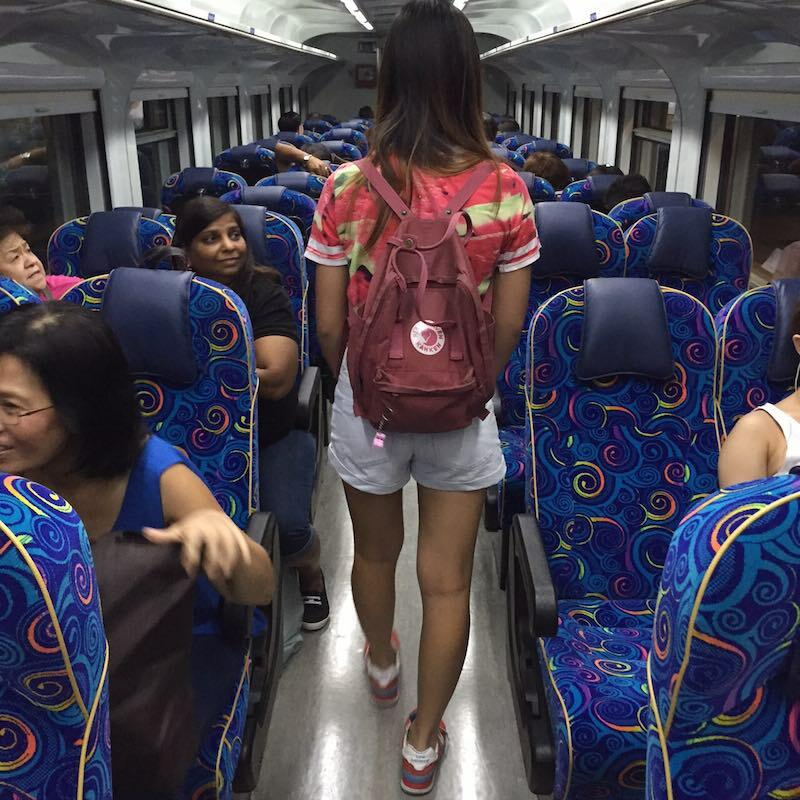 For example, a commuter that takes a Singapore cross-border taxi can board or alight anywhere in Singapore. Similarly, a passenger taking a Malaysia cross-border taxi can board or alight anywhere in Malaysia. But commuters need to board and alight at the designated terminals when they are not on the domestic leg, i.e. 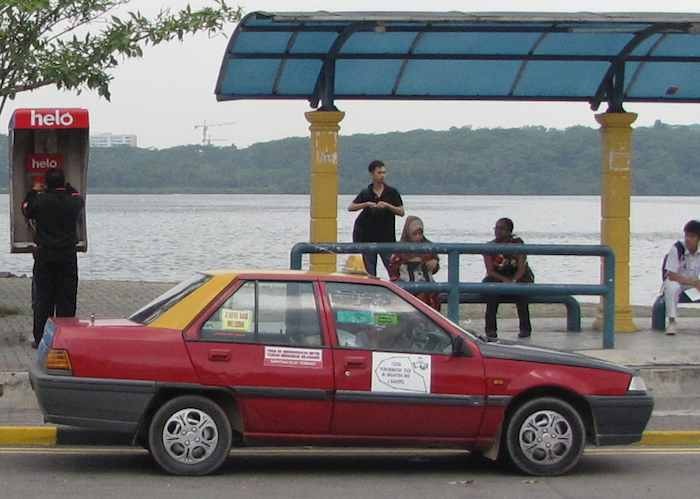 a commuter that takes a Singapore cross-border taxi can only board and alight at PasarBakti terminal in Johor Baru and likewise, a Malaysia cross-border taxi can only pick up or drop off commuters at the Ban San Street terminal in Singapore. The transportation improvements are critical to the success of Iskandar-Singapore success. Currently the delays on the current links are bad and increasing. It seems that the estimates for how much traffic would be generating have been far too low. The addition of the second link is recent and yet the delays keep getting longer on average days (not even holidays). This seems to me to be a serious problem, especially when you consider that in the next 2 years there will be substantial additions in Iskandar, Malaysia that would increase cross border traffic. But with the delays already unacceptably long it seems there will be serious problems. If there are process improvement and manpower adjusts that can help address these problems they should be a top priority (and why they haven’t been done already would be very puzzling). It seems to me a 3rd link is needed as soon as possible. In addition to the MRT and an expansion to the existing causeway capacity. The tweaks to allowing taxis to pick up passengers anywhere at the first leg of the journey (which is my guess at what is said above though I am not sure really) is good thing. This doesn’t do anything about capacity issues or long delays at the links but it is an improvement in the previous operating process (which required taxi pickup at 1 or 2 specified spots only in order to cross the links). Hopefully the restriction on dropping people off can be eliminated soon also. I don’t really understand the sense of the taxi process. There are cars that will pickup and drop off anywhere (for crossing the links) but are not painted up as taxis. I don’t quite understand the value of having different rules for cars depending on if they have meters inside or are considered something else (but do the exact same things a taxi does, but probably can’t pick up passengers on the street – probably they are only allowed to respond to phone calls). Anyway, at least the taxi process is improving. I did a bit of research trying to find the right cell phone plan for myself in Malaysia. I actually was looking at different options. One was for a fancy smart phone (iPhone or Android) largely to use when I travel and to be able to stay up with some business. Both looking at the phone options and the plan options. And the also looking at a cheap phone with a cheap plan. The truth is it was quite hard to get to a decision with so many options. I used the soon to be iPhone 4s as a good enough excuse to wait on the fancy phone option. I really don’t use a phone much. Frankly the biggest use I have for it is in getting taxis and ordering food – plus other errands but what I can do by email, I do. It is also convenient when you are meeting people somewhere to catch up with each other. Mainly I prefer email and other internet communication and don’t find most cell phone conversation of much value (it just seems like people think they have to talk since they can or some people seem to think they seem important if they ignore whoever they are with to talk on the phone). I would rather take in where I am, talk to who I am with, think, or just relax. So I keep looking for the best plan for someone that hardly uses a phone at all. It wasn’t easy to find. Partially, I imagine you don’t make much money off such cheapskates so the service providers don’t waste much time marketing to them. Anyway I thought I found something good with Digi. And when I was talking with the person to buy my phone I thought I had it clear I could get the phone and pay some minimal amount and then just top it up and be charged for use. But once I bought it they seemed to not understand such an option. Oh well, I sometimes seem to not quite communicate perfectly so I guessed I mis-remembered and didn’t understand what they said at first. So then essentially I needed to pay RM 30 a month for service and that amount would be charged against as I talked (or IMed). But I needed to pay RM 1 everyday to maintain the ability to make calls. This was annoying but seemed to be the only option. So I just kept piling on the RM balance since I don’t use close to 1 RM a day on average. Well I found the offer again earlier this week and it is perfect if you hardly use the phone, like me. You pay just RM 30 for a year. Then you still get charged for all your calls but it isn’t much at all. So if you want a low use, cheap, cell phone plan option in Malaysia, get the Digi Super Long Life plan: a feature where you can extend your talktime validity to 1 year for just RM30. That means your phone number stays valid, you can make and receive calls and texts (to make outgoing calls and texts you also need a balance, but you can add to your balance whenever you want). Remember the plan name, so when you go to buy your plan you can make sure you can get it setup right from the start. It is really a fantastic option for someone like me, that uses the phone very little. My guess is if you use it less than an hour a week, on average, this is a good option. I am really not sure the exact breakpoint, whatever it is, I am nowhere near it. Online I read a fair amount of people worried about taxi drivers not using the meter for cab rides in Johor Bahru. I have found that normally they do use the meter. Occasionally, taxi drivers do refuse to use the meter (even though I believe they are required to and the cabs are plastered with signs saying they must use the meter). I have noticed that if the taxi has to stand in a long queue, waiting for passengers, this problem is much more likely. It would seem to me, that there is a systemic problem, if the taxi has to wait a long time for fares. It seems to me the best way to handle this would be to put a surcharge on those locations (there shouldn’t be too many). I have refused to pay non-meter fares, but will pay reasonable ones from now on, from locations with long queues. Even when they want to charge a non-meter fare I think only twice have they asked for hugely unfair amounts (more than twice what the meter would be). Normally it is a maybe RM 5 above the meter, which isn’t ridiculously high (and they may be inflating it for me). Calling the taxis usually will get you a taxi very quickly (within 5 minutes) which is quite convenient. I would imagine in some areas outside the Central Business District (CBD) it might be longer. One of my driver’s stopped by the gas station and I noticed they were using compressed natural gas as the fuel. This is a smart move as globally there is a surplus of natural gas. Natural gas is also cleaner burning and contributes less to global warming than regular gasoline. 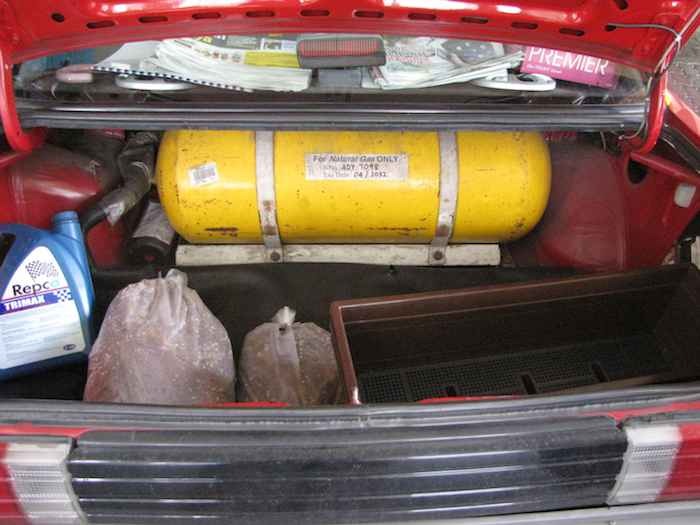 The storage tanks are in the trunk for some reason. The taxi drivers understand english to some degree. They are a bit less able to find places than I would expect, some are quite good but I have run into more than a handful that needed directions for pretty large places. The cars are generally fairly old but decent. Normally they have decent air conditioning, but some are weak on this. Like Kuala Lumpor there is a “executive” class taxi that is blue and much more expensive – I don’t see them being worth it, myself. The cost of rides is 3 RM for the first 2 km plus 10 cen to every subsequent 115 meters. There is a RM 2 charge for calling a taxi for a pickup (Taxi Comfort number: 07 332 2852). There is a 50% surcharge between midnight and 6 AM. In general people tip very little (like rounding up to the next RM). In general, I give a tip of 2 – 4.x RM. The taxi fares are reasonable and including a tip still results in a reasonable fair. Taxi drivers work hard for a living and giving a bit of a tip seems reasonable to me (for those who can easily afford it). One note about taxis in Singapore – there really don’t seem to be enough. When I want one, I find large queues that hardly seem to move (so few taxis coming to the stand). And when it rains it is much worse. 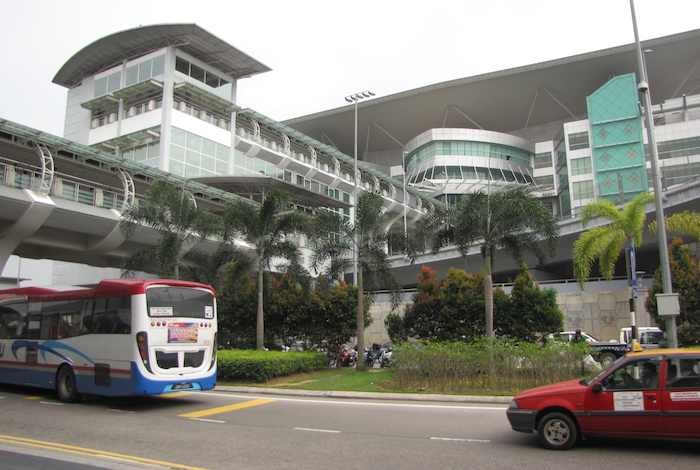 The Johor Bahru Customs, Immigration, and Quarantine Complex (CIQ) is a very large complex at the causeway to Singapore that accommodates Malaysian customs check for cars, trucks, buses and the JB Sentral train station. The CIQ was opened in 2008. The complex is know as CIQ – if you tell a taxi for example they will know where you mean to go if you say CIQ. The 2nd link (to the West) has shorter queues currently (these are the only 2 links between Singapore and Johor Bahru now). That is one of the reasons many people have been buying out near the 2nd link. Also that is a focus area for the Iskandar economic development initiative and the available of housing estates with integrated security and new bungalows is another attraction. JB Sentral, which opened in 2010, is located in the same area and includes the train station and a large bus terminal. 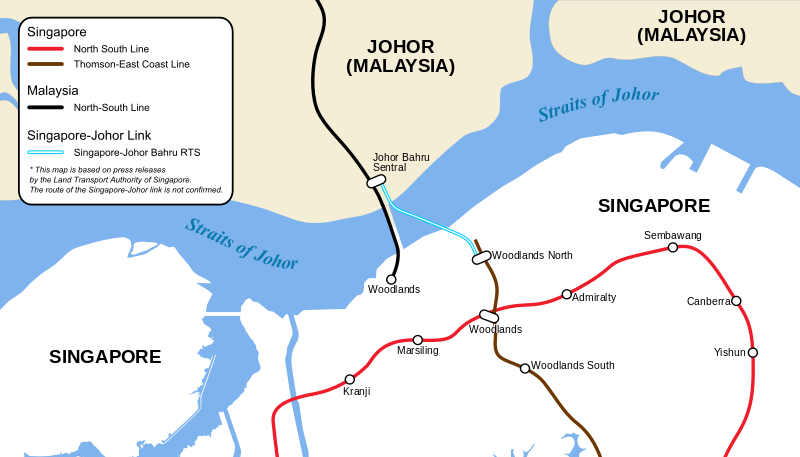 Singapore and Malaysia have been taking recently about extending the MRT (light rail) from Singapore into Johor Bahru before the end of this decade and the likely location of the first stop is JB Sentral. This MRT (and extending 5 to 7 more stops in Johor Bahru will be a welcome improvement to mass transit and continue to build the economic ties between the two cities. Currently you have to take the long walk through Malaysian customs, then walk to the bus, take it over the causeway, walk through Singapore customs, catch the bus again and then got to the MRT (which for some reason isn’t the closer Woodlands MRT but the Kranji MRT). So just getting on the MRT in JB and clearing customs and getting right back on will be a big improvement. Of course they will have to add quite a few more customs staff to prevent long queues.